Once a part of Chester, the town was known as Charmingfare, probably because of the many bridle paths or parades through pleasant scenery. It was named Candia in 1763 by Governor Benning Wentworth, possibly in memory of his sea travels following his graduation from Harvard. Candia was the name of the principal city of Crete. 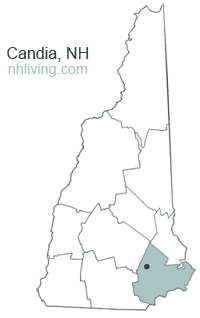 To share any Candia, NH information with us, please contact us. Learn more about advertising in NHLiving.